For more than10 years, Digger has been brightening up patients’ stays at Hunter Valley Private Hospital (HPVH). Late last year, a special celebration was held to recognise him as a long serving ‘staff member’ of HPVH. CEO Lance Wheeldon presented Digger with a special gift of designer dog bones to mark the occasion. He also received cards from patients and their families. Digger visits the hospital through the Delta Society’s Newcastle and Hunter branch. He is the first Delta dog to continuously visit a Hunter facility for 10 years. Digger’s owner Lousie Neylen said working as a therapy dog was “in his blood” – his father, Anzac, was also a therapy dog. 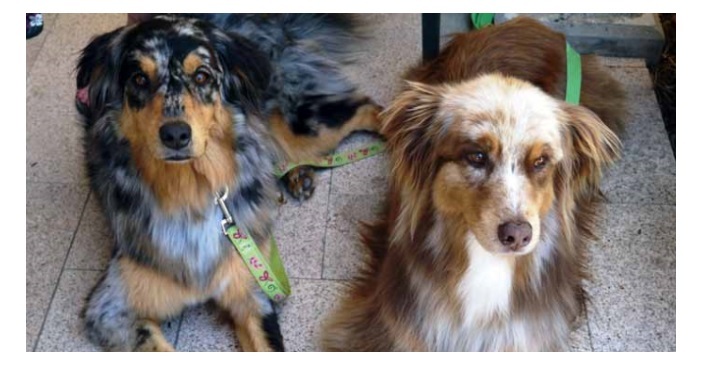 The 11-year-old Red Merle Australian Shepherd is HVPH’s only four-legged ‘staff member’. “His visits are particularly appreciated by some of our rehabilitation patients, such as stroke and trauma patients, who can be in hospital for several weeks” Digger has made about 450 visits to the hospital in the past decade. He spends around one-and-a-half hours on his visits to patients in their rooms and in the hospital’s gardens. The occupational therapy team sometimes has Digger attend special group sessions with patients. “His visits are particularly appreciated by some of our rehabilitation patients, such as stroke and trauma patients, who can be in hospital for several weeks,” Mr Wheeldon said. Digger also played an important role in spending extended time with palliative care patients and their families. Ms Neylen was once approached by a family member of a palliative care patient at a service station who wanted to tell her how much they appreciated Digger’s visits. Apart from visiting the hospital, Digger also goes to two local schools where children read to him. This year he performed in a production of Annie. Delta Society Australia is a national not-for-profit organisation with a mission to promote and facilitate positive interaction between people and companion animals. Its volunteer Therapy Dog teams brighten the lives of approximately 20,000 Australians in hospitals and care facilities every week.